Mine Kafon have reached their extended funding goal of €130,000! They’re now trying to raise another €60,000 to improve their detection methods to cover a wider range of mine types. The Hassani brothers Massoud and Mahmud grew up in a rocky, windswept part of Afghanistan, where landmines were a constant threat. Having few toys, they devised their own wind-powered playthings. Some of our readers may remember having read a Memorandum article in May 2012 about the wind-powered Landmine Kafon, whose design by Massoud Hassani resembled a giant ‘dandelion clock’ seed-head. It was awarded Design of the Year 2012 by the Design Museum of London, Icon Design of the Year 2012, and Breakthrough Talent of the Year 2012. A Kickstarter campaign followed, and in 2013 the Mine Kafon Foundation was established in the Netherlands. 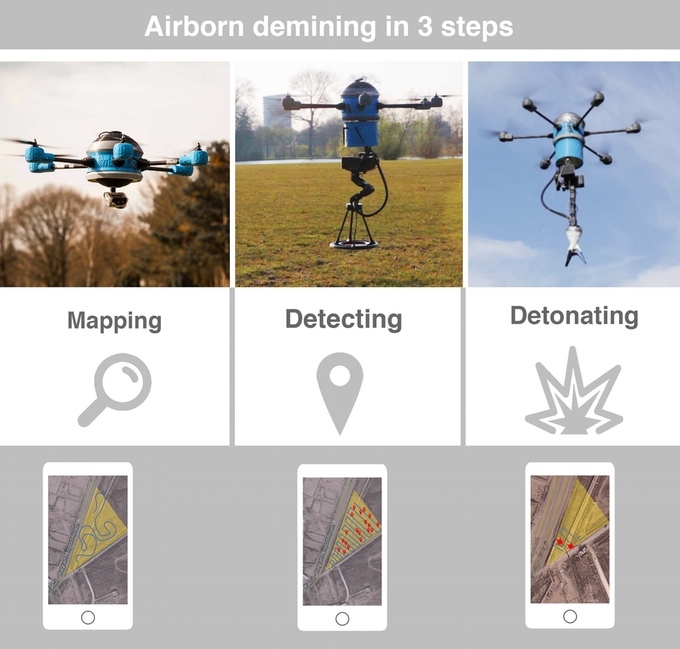 Their latest design is an unmanned airborne demining system, and after 3 years of work they are raising funds via another Kickstarter campaign to finish development and begin testing their Mine Kafon Drone in the field. Described as a robotic metal detector with integrated distance sensor and gimbal, this drone offers an innovative solution to landmine removal, claiming to clear minefields 20 times faster than people. The 3 steps of mapping, detection and detonation are operated by a device which resembles an airborne pogo-stick. Sensors and tools can be added to perform a wide variety of tasks, and the data from each operation is collected and analysed in a structured and systematic way. Engineers and designers from all over the world have collaborated on this humanitarian project, using 3-D printing, laser cutting and open-source software. They have already developed several working prototypes and have performed tests with the Dutch Ministry of Defence. Their motto is “Every life counts”, and their ambitious aim is “to globally clear landmines around the world in less than 10 years”. 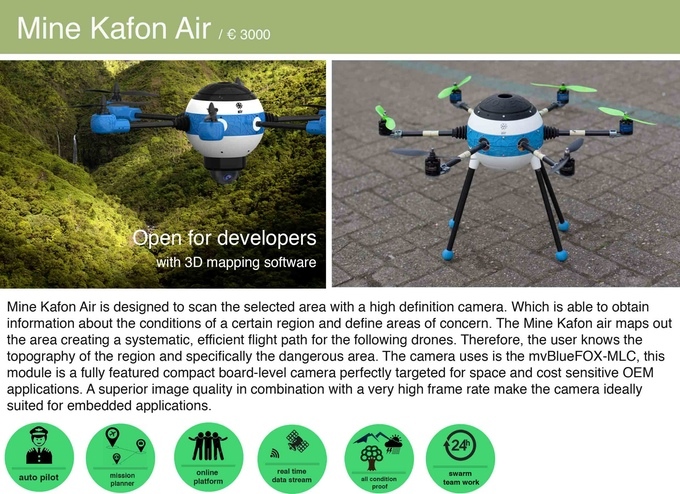 Although minefields can become obscured by trees and undergrowth through abandoned use of the land, this problem has been addressed by a further development: the Mine Kafon Air. This drone is designed to scan the selected area with a high definition camera, which maps out the area showing the topography of the region and specifically the dangerous area, creating a systematic, efficient flight path for the following drones. A photograph on the website shows it flying over heavily forested, undulating terrain. In order to increase accuracy, it uses triangulated GPS and external antennae in the field. This novel approach has opened up discussion on the viability of new methods of detection or clearance to replace or supplement the current painstaking methods. The device has been endorsed by industry experts in detection and clearance. MAG International has stated: “We will use the mapping drone right away once it is developed”, and Dan Church Aid has stated: “We would like to buy this tomorrow if it was on the market”.